The Swiss company COMLAB has been a specialist in high-frequency technology in the railway sector for 40 years, and develops, manufactures, sells and installs ready-to-use railway communication systems for tunnel and in-train use. Due to its longstanding experience as a single point of contact, COMLAB is able to guarantee unique standards of quality and know-how in every process stage. Innovative, reliable and durable, our systems represent a cost-effective, long-term investment for our customers. At the same time, our highly qualified engineers attribute the utmost importance to individual consultations, customer-specific solutions and support. Our key customers include international rail and train building companies, as well as mobile operators and emergency services organisations. With branches in Germany and China and its global co-operation with a wide range of partners, COMLAB is able to respond effectively to the requirements of its customers all over the world. Very high-speed train go through the shanghai lujiazui financial center . COMLAB provides a comprehensive range of wireless coverage solutions. COMLAB’s repeater systems are suitable for various applications such as railway and metro line tunnels, road tunnels, buildings and in-train coverage. Thanks to many international contracts, we are one of the market leaders in the railway sector. The system ensures that radio signals can be received inside their areas of use. Radio signals are not able to penetrate rock strata and certain strongly insulated areas, for instance. Therefore, the external antennas pick up the provider signals and the system amplifies and distributes them via leaky feeder cables or internal antennas. Radio systems for railway tunnels are extremely complex. Whether it is the train staff, the emergency services personnel or the train passengers, everyone needs to be supplied with mobile communications. This means that multiple radio networks are required to operate alongside each other. The COMLAB repeater system is a multi-operator and multi-band radio coverage system which is able to combine radio distress and safety systems (TETRA, TETRAPOL), global systems for mobile communications on railways (GSM-R) and public mobile telecommunications systems (GSM, UMTS, LTE) with one another, and to simultaneously protect them against mutual sources of interference. Train passengers and business travellers in particular expect excellent mobile reception. This includes the perfect voice quality, no dropped calls and easy data transmission. The COMLAB InTrain repeater solution perfectly compensates for the high signal loss caused by modern train vehicles, which are very well-insulated with special thermally-insulated glass. It was specifically designed for extremely challenging use on high-speed trains. 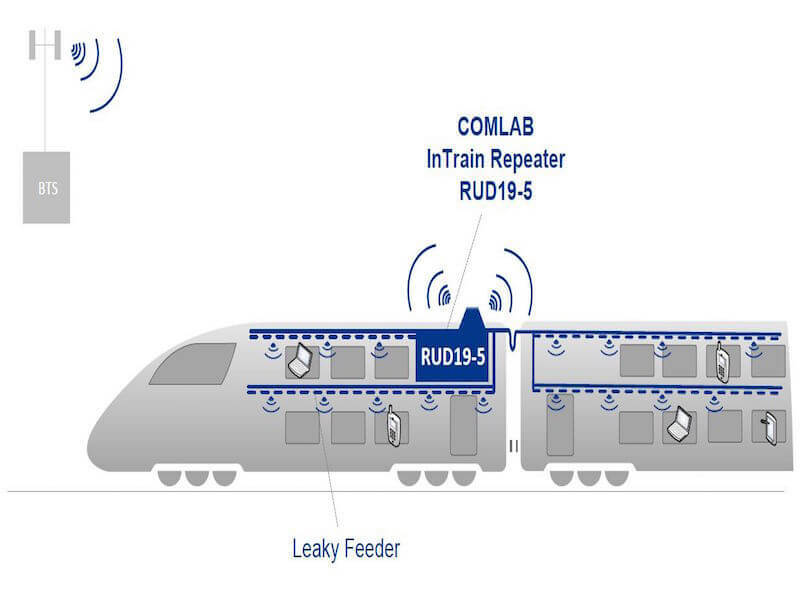 With the operator-specific and automatic gain-trailing, the COMLAB repeater system manages the rapidly changing outdoor signal levels of the various networks, and ensures an even and strong level of reception within the train. Even while travelling from one country to another, it still provides gapless coverage. The RUD-5 has been designed in order to extend radio coverage in various radio networks. Available as a fiber optical repeater or an off-air repeater, it is suited to numerous areas of use.